M7 Howitzer Motor Carriage "Priest"
The M7 used the hull and running gear of the M3 Medium Tank. It was called "Priest" because of the pulpit-like structure mounting the 50 cal. AA MG. The lower hull and running gear of the M3 Tank was used, with a raised open top superstructure added. Into this was mounted the 105mm howitzer with its split carriage. In an attempt to lower the height, the gun elevation was restricted to +35°, a handicap in mountainous terrain. This was not corrected until the Korean War when a full +65° elevation was obtained. This modification was designated the M7B2. 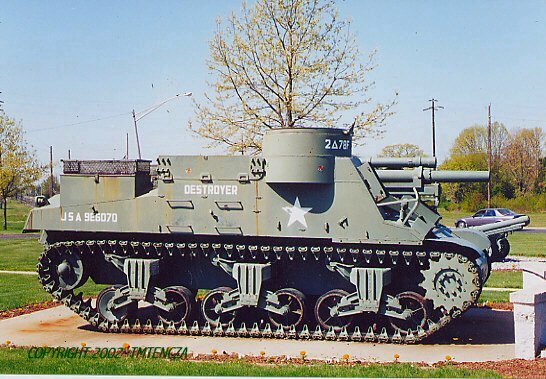 The M7B1 designation was used for the model which utilized the Sherman M4 chassis. First deployed at El Alamein by the British who received large numbers under Lend Lease. The M7 was a mobile and reliable vehicle and was used until the end of the war. One negative was its weight. A total of 3,490 were built.